When Kim Jong Un assumed power two years ago, foreign observers predicted North Korea would cut its losses short and disengage from Syria in the wake of the overthrow of friendly regimes in Algeria, Egypt and Libya. But this proved to be wishful thinking. On the contrary, Kim Jong Un got off the fence and has joined the Assad government to actively fight against the anti-government rebels in Syria, many of whom are affiliated with Al-Qaeda. Indeed, the DPRK says it is its duty to help a legitimate sovereign government in the fight against international terrorism in Syria. Careful reading of the DPRK Foreign Ministry’s latest tepid and contorted denial of the persistent rumors that Pyongyang supplies weapons to Syria or flies pilots in anti-rebel air raids suggests that North Korean arms and military advisors may indeed be engaged on the battlefields of the Syrian civil war but not necessarily in the exact manner alleged by the rebels and Western media. Pyongyang is known for its penchant to split hairs: it knows the facts, and even if the rumors come close to the reality, but do not exactly match it, Pyongyang will hit back hard. The fact that it hasn’t suggests that indeed there is fire where there is smoke. Why Did Kim Jong Un Come to Assad’s Rescue? In 2013, North Korea’s young leader stepped up military support for his country’s long-time strategic partner, the Assad regime, in the nationwide civil war against the radical Sunni rebels backed by the Western liberal democracies in alliance with conservative Gulf monarchies. Why is North Korea fighting for Assad? The well-entrenched Kim family came to the rescue of the faltering Assad family, exporting its trademark anti-American “revolutionary spirit of the offensive,” for four reasons. First, birds of a feather flock together. Both countries are former Soviet client states that lost their patron after the collapse of the USSR in the early 1990s. The collapse resulted in the loss of the strategic support that the Soviets had provided them, forcing Pyongyang and Damascus to abandon the dream of “strategic parity” with Seoul and Tel Aviv, respectively, and to adopt a new formula of “strategic deterrence,” vis-a-vis the ROK and Israel, as well as their allies and like-minded countries. In that context, both face an acute security dilemma in their respective neighborhood since they are also divided countries fighting to force out foreign troops that occupy what they believe are their homelands, namely the U.S. forces in the southern half of the Korean peninsula and Israeli troops in the Golan Heights. Finally, both have also been branded as “rogue states” and are isolated in the international community. The United States considers them as “states sponsoring international terrorism” and engaged in “nuclear proliferation” and, therefore, has imposed broad-ranging political and economic sanctions on both countries. This close political relationship is reflected in a number of ways. Neither country has been willing to normalize relations with the other’s enemies. The DPRK rejected Israeli overtures in the early 1990s seeking to establish diplomatic relations, despite Israeli promises to pay considerable compensation (up to USD 500 million) if Pyongyang were to abandon Syria and terminate its missile sales to the Middle East. Similarly, Syria rejected past ROK attempts to normalize relations, unlike the former Soviet Union and China, despite its growing trade and investment links with Seoul. Pyongyang and Damascus also support each other in the United Nations and other international organizations. For example, upon cues from Damascus, Pyongyang denounces US proposals for the Middle East peace process, Lebanon situation, Palestinian problem, and Arab-Israeli settlement. In turn, Syria supports the DPRK’s positions in various talks on denuclearization of the Korean peninsula and inter-Korea reconciliation. State-to-state and party-to-party ties are well developed and based on extensive institutional links and personal affinities. Since the beginning of this year alone, Kim Jong Un has exchanged personal letters with Bashar Al-Assad on ten different occasions—more than with any other foreign leader, including Chinese. Many senior DPRK leaders have either visited Syria over the past two decades or worked closely with its government. For instance, Kim Yong Nam traveled to Syria as President of the SPA Presidium in July 2002 and June 2000, and as Foreign Minister in July 1992. Former KPA Chief of General Staff hardline general Kim Kyok Sik served as North Korea’s military liaison to Syria in the tumultuous 1970s, coordinating the North’s military assistance to the Assad regime during the October 1973 Arab-Israeli War and post-war rehabilitation of Syrian armed forces in the mid-1970s. He also managed North Korean military sales and military construction projects there for almost a decade. As a result, many North Korean leaders have some personal knowledge of Syria and its leaders, as well as a good understanding of Pyongyang’s stakes in its relationship with Damascus. 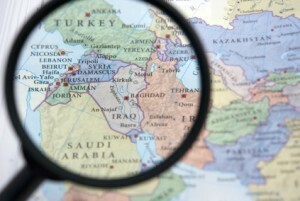 Second, in addition to being birds of a feather, geopolitical considerations also push Pyongyang to assist Damascus. As a strategic partner of both Syria and Iran, North Korea may have been contracted by Iran to defend their mutual ally in Damascus. It is also plausible that there may be some DPRK-Syria-Russia connections in the area of military-technical cooperation, probably, in the development of Syrian air defense capabilities. Pyongyang takes full advantage of all-out Russian and Iranian support for Damascus “to defend the frontline of the joint anti-American and anti-imperialist struggle” on the Syrian battlefield without fear of being depicted as a pariah or having to pay diplomatic or political price for its actions. Pyongyang may also seek to divert Washington’s attention and resources away from the Korean peninsula by waging a proxy war against the United States and its allies in Syria. The North Korean leadership is not ignorant or naive. It does understand that if the US gets sucked into another war in the Middle East during “sequestration,” not only will it undermine the short-to-mid-term credibility of its defense commitment to South Korea, but it will also buy time for Pyongyang to further build up its own nuclear arsenal and advance its war preparations against the South. Fraternal assistance in several Middle Eastern wars: Since Israel joined the UN coalition troops fighting in the Korean War, the DPRK government has never considered it inappropriate or unwise to send troops to aid the Syrian government in the Arab-Israeli wars in the Middle East. For instance, the DPRK sent 25 pilots to Syria to defend the air space over Damascus during the Arab-Israeli war of 1967. In 1970, the DPRK dispatched 200 tank crewmen, 53 pilots, and 140 missile technicians to Syria. During the October 1973 Arab-Israeli War, the DPRK dispatched 30 pilots to Egypt and Syria, who provided training for Syrian pilots to fight against Israel. Moreover, the North Korean Air Force pilots themselves flew the Soviet-made Egyptian and Syrian airplanes during some key air battles. In 1975 and 1976, Pyongyang sent 75 Air Force instructors and 40 MIG pilots to Damascus, respectively. In 1982, during the Lebanese civil war, the DPRK government dispatched SOF (special operations forces) servicemen to Syria to provide training for guerrilla operations, some killed by the Israeli military. In 1984-1986 and 1990, 50 and 30 North Korean military instructors were sent to Syria, respectively. Military Education and Training: In the mid-1980s, Kim Jong Il approved the request of the Syrian government for its military officers’ to be educated and trained at DPRK military educational institutions at the expense of North Korea. Since then, the North Korean military has been training Syrian military officers at the Kim Il Sung Military University (an analogue of US National Defense University). Officers at the colonel rank usually participate in the one-year high-level officers’ course. Syrian officers at the captain rank are also admitted to the four-year course. They are taught military strategy, operational art, and military tactics, including guerrilla operations. Kim Jong Il is said to have followed with interest the successful careers of the Syrian general officers who graduated from the university. Foreign military sales: Beginning in the late 1970s through the 1980s, the DPRK supplied Syria with various conventional weapons such as rifles, guns, mortars, ammunition, bombs, armored vehicles, anti-tank missiles, radars, and even military uniforms. In particular, in 1978, the DPRK sold 300 recoilless guns to Syria. In 1982, when the civil war broke out in Syria, the Syrian military killed 20,000 civilians by firing “BM-11, 122mm MLRS (Multiple Launch Rocket System),” the weapon system imported from the DPRK. The Israel military snatched the notorious “BM-11” from Syria during the Lebanon war in 1982, killing 25 KPA soldiers who serviced it. In 1992, Pyongyang shipped 20 tons of bombs to Damascus. The Syrian conflict provides the North Korean military with an opportunity to gain valuable “real world” experience. Reportedly, North Korean advisors provide technical assistance to Syria’s defense industry, especially factories southeast of Aleppo, in addition to engineering and construction assistance in repairing and rehabilitating destroyed military infrastructure. The KPA is also involved in operational planning and supervision of artillery warfare as demonstrated by the battle for Qusair. The North Korean military advisors are probably involved in planning and execution of the air and air defense operations of the Syrian army as well as collecting battlefield intelligence on the combat use and performance of Western arms, especially those that can potentially be used in the Korean battlefield. Finally, the Syrian civil war offers the North Korean military planners the first-hand look at the combat tactics of anti-regime rebels trained and guided by the US and its allies. And for good measure, there is no doubt that North Korean military advisors are also tasked with erasing any traces of Pyongyang’s past assistance to Assad’s programs to build weapons of mass destruction just in case he does lose power. Given the history of DPRK-Syrian relations, despite what the North might say in public, it would be surprising if the North had not dispatched a small contingent of military advisors and instructors to aid the brotherly Assad regime in its fight against the anti-government rebels. Although that assistance is probably limited and does not have the potential to fundamentally change the course of the civil war, North Korean military expertise can affect the outcomes of local tactical battles, adding to the winning momentum of the Assad forces. Moreover, North Korea’s involvement in Syria may be an indicator that the Kim regime discounts the likelihood of any possible breakthrough in relations with either Washington or Seoul in the near future and views the risk that its national policy goals will be adversely affected by increasing support for the Assad regime as manageable. Pyongyang’s involvement in Syria characterizes Kim Jong Un more as a steady hand and traditional alliance manager than an erratic wanderer and opportunistic risk-taker. Although he is playing with fire in the shifting sands of far-flung lands like Syria, but he is simply staying the course set forth by his grandfather and upheld by his father, demonstrating continuity in North Korea’s foreign policy. Moreover, potential material and reputational rewards far outweigh possible security or diplomatic risks, especially if Kim’s bet on Assad’s eventual victory proves to be correct. The DPRK’s decision to cast its lot with Damascus may upset wealthy Gulf monarchies—like Kuwait and Qatar—sponsoring the anti-Assad rebel groups and cause them to rethink their employment of North Korean labor and services in construction and irrigation system development projects and their provision of low-interest funds for some of Pyongyang’s infrastructure projects. On the other hand, it may help Pyongyang earn much greater financial or in-kind compensation from other states concerned, including Iran, Russia, and others, and develop new diplomatic clout in the Middle East if Assad eventually wins. Pyongyang’s support for Syria may provoke Jihadist elements to strike back, but it is more likely that the KPA will gain valuable combat experience against the new age enemy—irregular anti-government militia fighting in a suburban setting. Finally, North Korea’s support for Syria may provide new fodder for others to further demonize Pyongyang but it also offers the North a chance to stand by a long-time ally in need, to show its resolve to fight for state sovereignty and territorial integrity on the world stage, and to prove with deeds it is fighting against Al Qaeda and international terrorism, even when it might be more expedient to do otherwise. “DPRK Refutes False Rumor about Its Involvement in Military Operations in Syria,” KCNA, November 14, 2013. “Choe Thae Bok Meets Syrian Delegation,” KCNA, June 28, 2006. “Kim Yong Nam Meets Syrian PM, High-ranking Officials of Iran, Cuba,” KCNA, August 4, 2013. “Israel-ROK Bilateral Relations: Historical Overview,” http://embassies.gov.il/seoul/Pages/default.aspx. “FM Dir-Gen Savir Briefing to Foreign Journalists – 24-Jun-93.” Israeli Ministry of Foreign Affairs, June 24, 1993. “102. Government Decision on Talks with North Korea, 17 August 1993” Israeli Ministry of Foreign Affairs, VOLUME 13-14: 1992-1994, August 17, 1993. “Syria recognizes DPRK only,” KCNA, January 10, 1997. On January 5, 1997, when he was receiving credentials from the newly-appointed DPRK ambassador to his country, Jong Chun Gun, the then-Syrian President Hafez al-Assad stated that there will be no change in the position of Syria recognizing only the Democratic People’s Republic of Korea in the Korean peninsula. The firm relations of friendship between Syria and Korea will remain unchanged, he stressed. 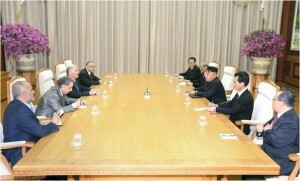 When the DPRK government declared its decision to withdraw from the NPT in January 2003, Wolid Hamdoun, member of the leadership of the Syrian Arab Socialist Baath Party and chairman of the Syrian Arab-Korea Friendship Association, and Gaji al Dib, director general of the Syrian Arab News Agency (SANA), when meeting the DPRK ambassador to Syria, said that “Syria and the DPRK are standing in the same trench of the struggle against the U.S. vicious and aggressive offensives and expressed full support to the principled stand and decision of People’s Korea.” When the Bush administration labeled the DPRK as part of the “axis of evil” in January 2002, the Syrian government sent a Foreign Ministry delegation headed by its vice-minister Suleyman Hadad for consultations to Pyongyang. He told Yang Hyong Sop, vice-president of the SPA Presidium, that “the Syrian people would stand firm on the side of the heroic Korean people.” It is noteworthy that shortly after the talks, Syrian Deputy Foreign Minister issued a statement, dubbing the US as the true “axis of evil” and expressing full support for the DPRK’s stance. For instance, Yang Hyong Sop, Vice-Chairman of SPA Presidium, visited Syria in March 1993. Kim Yong Il, former DPRK Premier, visited Syria as Minister of Land and Marine Transport in 2005. Choe Tae Bok, Chairman of SPA and WPK CC Secretary in charge of international affairs, visited Syria twice in June 2000 and in October 2007. Vice-Marshal Kim Il Chol, former Minister of People’s Armed Forces, visited Syria in June 2000. Pak Ui Chun, DPRK Foreign Minister, served as DPRK Ambassador to Damascus in the early 1990s. Party Secretaries Kim Yang Gon and Kim Yong Il received visiting senior Syrian officials in Pyongyang on numerous occasions. “경애하는 김 정 은원수님께서 전승 ６０돐 경축행사에 참가하기 위하여 우리 나라를 방문하고있는 수리아아랍공화국대표단을 접견하시였다,” Rodong Sinmun, 25 July 2013, http://www.rodong.rep.kp/ko/index.php?strPageID=SF01_02_01&newsID=2013-07-25-0001&chAction=T. North Korea’s war strategy of massive retaliations against US attacks (Part V) Han Ho Suk, Center for Korean Affairs, Association for Asian Research, May 7, 2003. The Yom Kippur War Smooth Stone, October 11, 2005. Damascus is alleged to have used a portion of the $2 billion, which it received from Saudi Arabia for being a part of the coalition in the 1990-1991 Persian Gulf War, to finance its missile purchases from Pyongyang. Ron Ben-Yishai, “Why Is He Arming Himself?” Yediot Ahronot, September 16, 1994, Saturday Supplement, pp. 2-4. In mid-June 2013, Syria’s opposition stronghold of Qusair was shelled at dawn with a massive rocket, artillery and mortar fire barrage, and overrun by government forces backed by Hezbollah militants. Arab-speaking North Korean military advisors were integral to the operational planning of the surprise attack and artillery campaign execution during the battle for Qusair, the capture of which represents a significant military and symbolic victory for the Assad regime and its Hezbollah allies and potentially changes the Syrian civil war dynamics. Since the establishment of diplomatic relations with Kuwait in April 2001, the DPRK government and Kuwait Fund for Arab Economic Development (KFAED) have signed three long-term loan agreements to finance the development and modernization of basic infrastructure in North Korea.